Roasting vegetables is the best way to cook them in our opinion, and the easiest way to get people to eat more veggies. 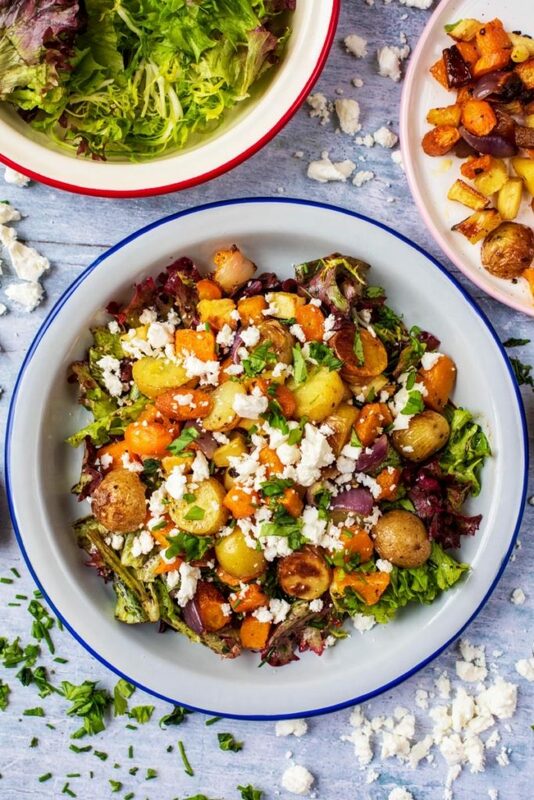 This Roasted Vegetable Winter Salad is a salad for people that think salads aren’t filling or they think they are boring. It’s the salad for people that think they don’t like salads! Warm and hearty – perfect for a cold winter day. Winter is all about comfort food, but that doesn’t mean that can’t include salad. Just make sure the salad is loaded with warm and hearty toppings that will keep you going. A salad is more than just green leaves after all. Pick you favourite seasonal winter ingredients and put them on a salad. I must admit, that these roasted vegetables nearly didn’t even make it on to a salad. When they came out of the oven I had to give them a try to make sure that they were done and I just couldn’t stop. They were done, so my taste test should have been over. But I only tried a potato, so surely I needed to test the carrot, butternut squash, parsnip and red onion too? I did, and they were all cooked and delicious. But was the potato I first tasted actually cooked, or was it just that one? I will try another one. Before I knew it, I had “tested” half the pan and the salad still needed to be made. But luckily for you, I managed to throw it on a salad before I could eat it all and I managed to photograph this recipe to share with you. The things I do for you guys! It just goes to show that roasting vegetables is the best thing you can do with them. There really isn’t a whole lot of effort needed to make this salad, and that’s the way it should be. Sure, roasting the vegetables takes a little while, but whilst they are cooking you can get on with other things. 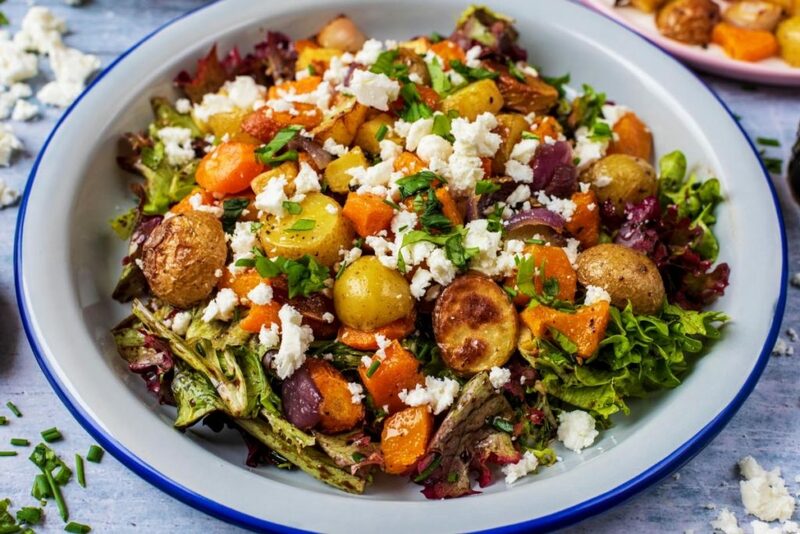 Just roast up the vegetables, dump them on top of a salad, drizzle over the dressing and then sprinkle with some creamy feta or a dairy free equivalent to keep it vegan. You can roast up any vegetables you like and broccoli and cauliflower are really good alternatives, as they get nice and crispy when roasted. What Salad Dressing To Use? Now, let’s talk about the dressing for a minute shall we? As a dressing as really make or break and salad. We made a dressing that was bursting with fresh herbs, because a dish with this many vegetables needs a good mixture of herbs to go with it. If you have a few different herbs to use up, then this dressing will help you to do just that. Remember, we are all about wasting less food at the moment and herbs are one of those things that always go to waste. You buy some for one recipe, only use half, and then they are left to wilt in the back of the fridge. No more! Make this dressing instead. We mixed the herbs with a good glug of olive oil and some balsamic vinegar and seasoned it. Next time I would add a squeeze of lemon juice and some zest too. Can You Make This in Advance? You can roast all the vegetables in advance and then mix them with the salad, dressing and cheese just before serving. It’s best not to mix everything in advance, as the salad can get a little soggy. The vegetables really are the star of this salad, however that doesn’t mean that you can’t top it with something extra too. You could add a grilled chicken breast or some grilled salmon or prawns on top to give it a protein boost. If you want to keep it vegetarian, then mix some cooked chickpeas in when mixing the salad. One: Chop all the vegetables so they are fairly chunky. Put them in a bowl with 1 tbsp olive oil and some salt and pepper and mix well. Two: Put on a baking tray in a preheated oven at 200C for 35-40 minutes. Three: Make the salad dressing by mixing together the olive oil, balsamic, salt, pepper and herbs. Four: Divide the salad between 2 bowls and top with roasted vegetables. Five: Drizzle the dressing on top and crumble over the feta. Roast any vegetables you have that need using up. Cauliflower and broccoli roast well too. Mix up the salad greens by adding some spinach and kale. Keep the salad vegan by skipping the feta, or using an alternative. Add some extra texture to this salad by sprinkling some seeds on top before serving. Next time I would add some lemon juice and zest to the salad dressing too. 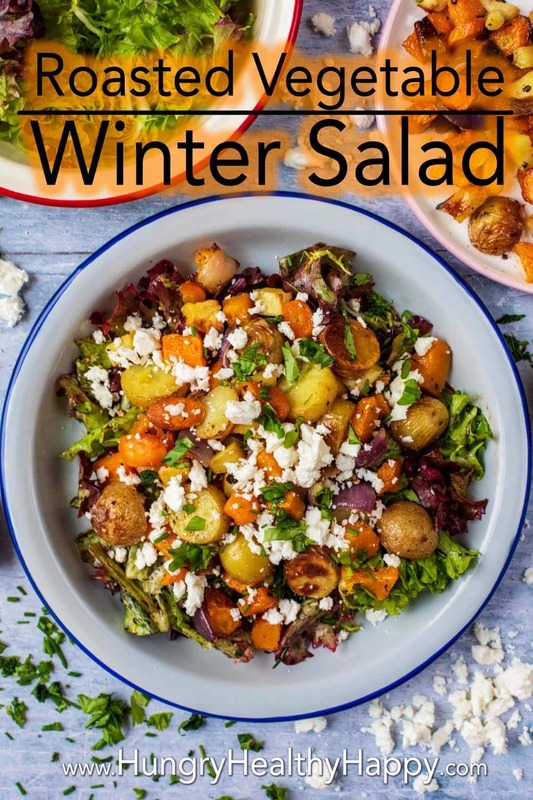 Do you want to be kept up to date on more delicious posts like this Winter Salad? Please subscribe to the blog mailing list (it takes 30 seconds). This Roasted Vegetable Winter Salad is a salad for people that think salads aren’t filling or they think they are boring. It’s the salad for people that think they don’t like salads! Chop all the vegetables so they are fairly chunky. Put them in a bowl with 1 tbsp olive oil and some salt and pepper and mix well. Put in a preheated oven at 200C for 35-40 minutes. Make the salad dressing by mixing together the olive oil, balsamic, salt, pepper and herbs. 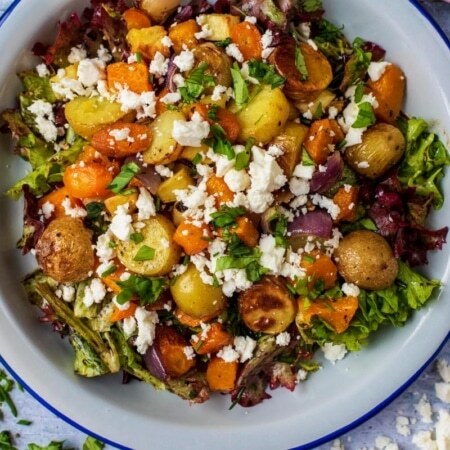 Divide the salad between 2 bowls and top with roasted vegetables. Drizzle the dressing on top and crumble over the feta. You just solved my conundrum of what to serve with Greek-style lamb cutlets when our neighbour comes over at the weekend. This looks so delicious. No parsnips here though 🙁 so might have to sub with celeriac. 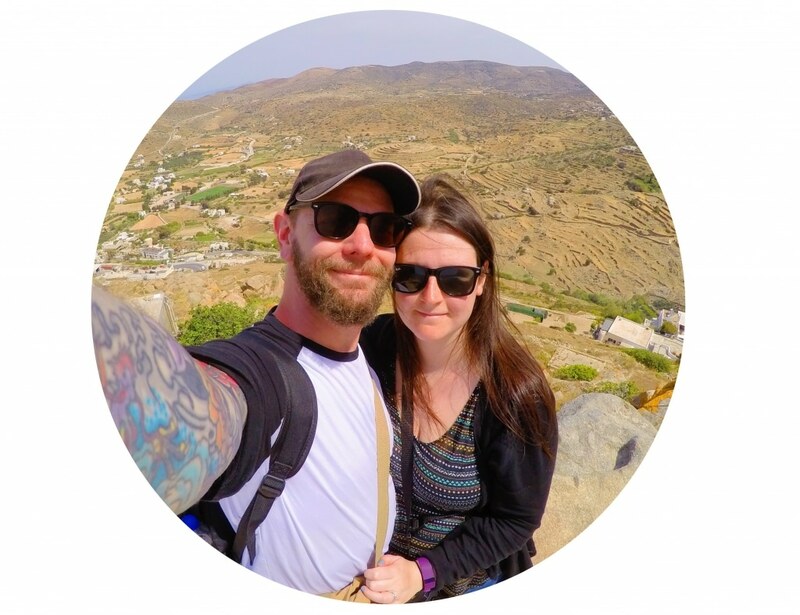 Have only just discovered this blog – looking forward to a browse. Thanks for the recipes. Thank you so much for this recipe! Since I’m trying to lose fat, im on the look for healthy food that I actually like. I tried my best searching for these kind of recipes but didn’t find one in a long time. I eat vegetables but I never really thought of them as something delicious, especially not when its a salad. Since I’ve found this recipe I eat it once or twice a week, and I’m even looking forward to eating it. I looked at some other recipes you made and they’re awesome too. One week I even ate one of the recipes everyday. Thank you so much for making my life a lot healthier. First, I want to say thank you for all your recipes. I have been trying now for so long to make my food healthier but did not really know how to do that. I never know which vegetables fit together. When I try something it usually does not taste very good. Thanks to these tips, I eat much healthier. I never thought that vegetables could be so tasty. Thank you very much! Adding roasted vegetables is one of the only ways I can make myself eat a salad in the winter so this looks perfect for me! I love all of the vegetables in this salad! Winter salads are the best, aren’t they as you can make hearty roast vegetable ones which don’t wilt in the fridge!. Yum, I look forward to trying this. I love these kinds of salads, hearty and healthy at the same time! Looks delicious! Very much like this kind of salad mixing veggies and greens, sounds healthy and flavorful, can’t wait to try it! I love the flavor that roasting the vegetables adds. I’m going to surprise my husband with this for dinner. Thank you! This sounds like such a tasty winter salad! A great way to use up any veg that you need to. We love squash in our house. This salad sounds so delicious! Thanks for sharing. I love this blog. I was checking constantly this blog and I am impressed! Very helpful info particularly the last Recipe. I care for such information a lot. this sounds incredible amy! i am always looking for ways to make my weeknight meals tasty and healthy and this sounds perfect. What a tasty looking winter salad! I’m with you, I’d start ‘testing’ the veggies and barely be able to stop!